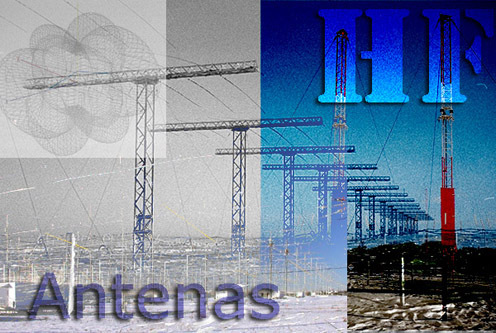 This article describes the characteristics of an horizontal dipole and shows the results of several simulations made with MMANA-GAL, covering models for the 20 m, 40 m and 80 m bands. The goal of the simulations is to study the optimum height to install the dipole in order to work in NVIS (Near Vertical Incident Skywave). 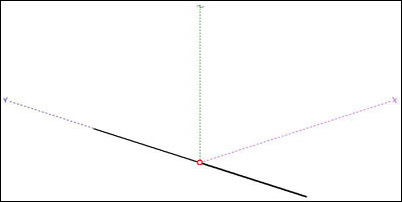 The fig.1 shows the horizontal dipole modeled in MMANA-GAL, laid along the "Y" axis. Fig.1. Horizontal dipole model in MMANA-GAL. The horizontal dipole has two arms with a total length calculated as L = ( 142,5 / Frequency MHz), and is built using wire of 2 mm in diameter. The table 1 shows the lenghts to be used in the 20 m, 40 m and 80 m bands. Table 1. Size of the dipole for different bands of interest. The patterns shown in this section belong to a dipole for the 20 m band, being quite similar for the rest of bands. 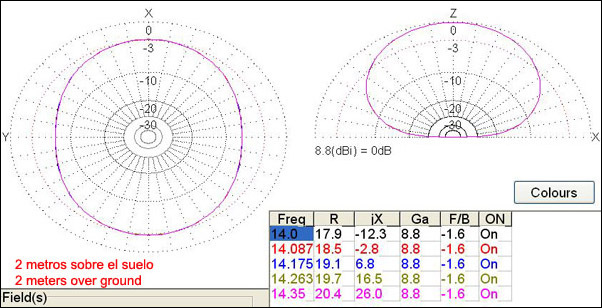 The pattern is bidirectional with radiation lobes perpendicular to the antenna's axis and the maximum gain is 2,12 dBi. The fig.2 shows the radiation pattern of the dipole installed at a height equal to 1/4 of the wavelength. Fig.2. Radiation pattern of a dipole for the 20 m band with height 1/4 of the wavelength. The fig.3 shows the radiation pattern of the dipole installed at a height equal to 1/10 of the wavelength. Fig.3. Radiation pattern of a dipole for the 20 m band with height 1/10 of the wavelength. The optimum height over ground for NVIS operation is equal at 1/10 of the working wavelength, in which case an antenna coupler may be necessary. Increase this height for DX operation. The table 2 shows the optimal heigths to install the dipole working NVIS in different bands. Table 2. Optimal heights of installation to work in NVIS.